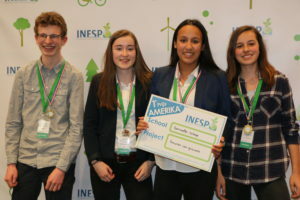 In cooperation with the company Texperium four high-school students from the Bonhoeffer College Bruggertstraat (Enschede, The Netherlands) have investigated the recycling of glass fiber in wind turbines. This work was part of a project with the scope of ‘Technasium’, where pupils perform corporate assignments in research and design. The team has won the first prize at INESPO, an Environment Sustainability Olympiad. Wind turbines are largely made of glass fiber, which is the main material used in the rotor blades. Since wind turbines are nowadays being produced on a large scale, the amount of waste from depreciated wind turbines will increase rapidly in the coming years. This is a major environmental burden. After extensive research, the team has found a solution for recycling glass fiber in rotor blades to reduce this environmental problem. INESPO is an annual Sustainability Olympiad in The Netherlands for students who want to improve the world with their ideas. At the national finals, on Saturday 8 April 2017, 50 teams presented their work to a professional jury. They assessed the technical and economic feasibility and sustainability value for each project. The jury saw a lot of potential in the idea of the four students and spontaneously mentioned several companies that might be interested. The awarded prize means that the team will go to Pittsburgh (United States) to INTEL-ISEF 2018 in the area of sustainability. INTEL-ISEF is the world’s largest school Olympiad, an annual event. In this competition, high-school students from 70 different countries are awarded a total of $ 4,000,000 prize money. In the coming year, the team will perform additional research to optimize and improve the solution, for instance by recycling more of the wind turbine’s materials. This can help to contribute to a better world!